CNRI/National Audubon Society Collection/Photo Researchers, Inc. Reproduced by permission. 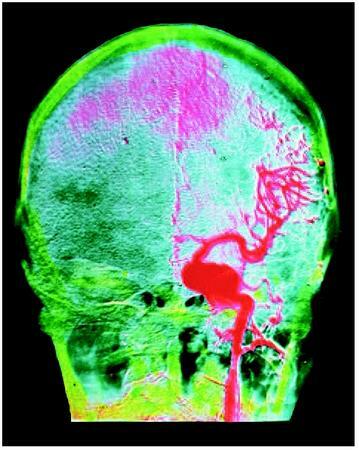 Angiography can also be performed using MRI ( magnetic resonance imaging ) scanners. The technique is called MRA (magnetic resonance angiography). A contrast medium is not usually used, but may be used in some body applications. The active ingredient in the contrast medium used for MRA is one of the rare earth elements, gadolinium. The contrast agent is injected into an arm vein, and images are acquired with careful attention being paid to the timing of the injection and selection of MRI specific imaging parameters. Once the information has been captured, a workstation is used to process and reconstruct the images. The post-processing capabilities associated with CTA and MRA yield three-dimensional representations of the vascular pathology being studied and can also be used to either enhance or subtract adjacent anatomical structures. Radiological Society of North America CMEJ. Renal MR Angiography. April 1, 1999 [cited June 27, 2003]. http://ej.rsna.org/ej3/0091-98.fin/mainright.html . Thanks for information about angiography..the information is complete. You may kindly mention what precautions to be taken in diet after the angiography. Or no special care is required. This is a very informative and educative article. It enlightens people about the process benefits and risks involved. Thank you for article - very informative - i needed to know as my brother is going for one on Thursday. Before angiogram, is it need to control heart rate? Some of the cardiologist in Myanmar want to maintain heart rate < 60 bpm prior to CT angiogram. No one mentions percentages very much any more but what is the risk of having a blood clot with eye angioplasty? If a clot does occur do tehy use med to dissolve it? waht is teh name of that med? What are the advantages and disadvantages of Angiography? is angiography is harmful for dialysis patient? and what kinds of precaution needed for dialysis patient? Heparin is normally given in the ER during for patients having an active MI(myocardial infarct). It is a blood thinner. this mixed up fuzzy feeling clears up! Thank you so much Patrick. Is cerebral an-geography a pain full test and this test is necessary? Is cerebral an-geography a pain full test and when this test is necessary? Very informative and easily understood by laymen. Type of preop sedative given: oral or IV? If allergy is unknown and the pt is fearful could Benadryl and steroid be given preventively? My husband is having pain in the area of the clot. Angio showed a 90+ occlusion of the right internal carotid. When a very thin wire was passed through the opening, the clot material closed around it. When the wire was retracted, the occlusion was 100%. They were unable to do the angioplasty or place the stent. Immediately post op he was complaining of pain in the area of the clot. The procedure was more than 2 weeks ago. He is still having pain. I do not know what contrast was used. The docs keep giving him pain meds. An info on this subject would be helpful. Thanks for complete information in a very easygo way. One could understand the complete process of the same. Is it possible for a diabitic patient to go for angiography ? Hello I am very concerned that 17 angioplastys through the groin (given 7 in 5 days) and all in total over 2 half years seems alot, is it?